She tilted her head. What she saw angered her to fling a small but big rod- a goat! It was a goat who was threatening the bitter-leaf Aduke had prepared to make egusi-soup inside a red pot. bamboo-door rounded by barbed wires- it was to prevent goats from venturing into the barn. her mouth as she spoke with passion. chimney moisturized her face. She hissed, and then rose-up from the bamboo seat. 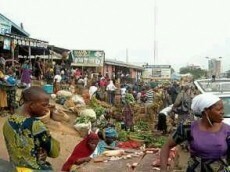 She has finalized everything on her own- Aduke would rather stay home than joining the market women. © Copyright 2019 Salaudeen Akeem Babatunde. All rights reserved.